Rory Shepherd is a Head of operations at Little Red Door, in Paris. He makes two cocktails for us, one with Aquavit and Cynar and the second with Gin and Birch Water. 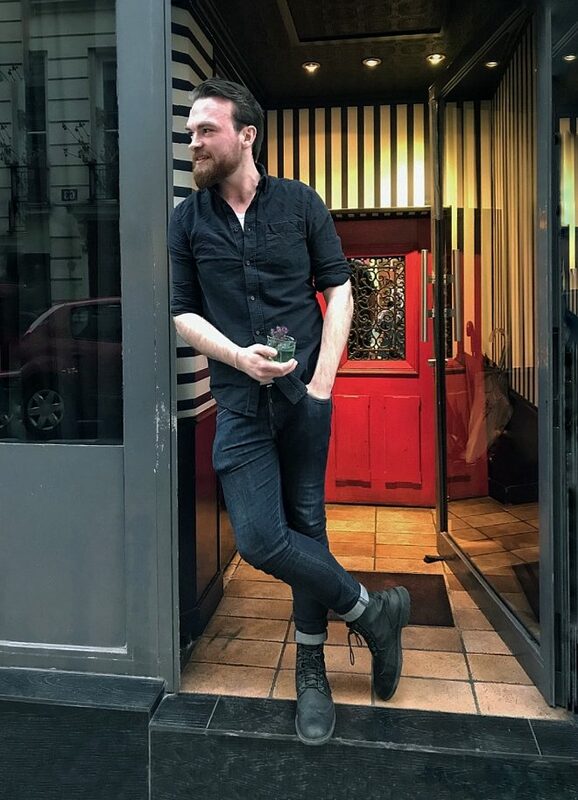 My name Rory Shepherd and I’m originally from Scotland, even if I now work at Little Red Door in Paris. I worked in a couple of pubs then moved to London for university to study events and started working in cocktail bars, like the Underdog in Shoreditch. Then, with a friend we created a pop-up bar called the Shrubbery and we kept doing cowboy style pop-ups, until I moved to the Library as bar manager with the guys originally from Happiness Forgets and Milk and Honey. When my girlfriend moved to Paris for a job opportunity I decided to move with her and began as bar manager at Le Ballroom a high volume bar which was a real challenge, because I had to create a menu that was simple and creative at the same time. I met Remy two years ago and joined the Little Red Door team and now I am head of operations and creativity for the whole Bonomy group, which includes Little Red Door, Lulu White and Bonhomie. Currently I am spending more time at Little Red Door finishing the new menu which we will release at the beginning of may. The idea was to create the menu with the whole team like we did last year, but it’s an entirely new team, so we worked on it for 8 months. It’s a take on a study about society and values that everyone shares and finds important. The way we created the menu was by asking two members of the staff to create two drinks together. Then all the drinks are tasted by the whole team to fine tune them or start again. We will have 11 cocktails on the menu all served in a new set of glasses. Going through the menu is a journey starting with the first cocktail and concluding with the last. After a customer has finished the journey there will an interactive part for them to complete on the web, if they want to be reminded of their experience. We purposely mixed bartenders who were from different backgrounds, had differing visions and who were unfamiliar to each other to enhance the project and create a real team spirit. You’ll have a sample of the new menu with my signature drink which I’ve made for you. I’ve always managed high level places like here. Bars with great cocktails, or restaurants with fine food. So for my dream bar it would be something very different. I’d like a cosy local hotel in the countryside with a simple, creative cocktail menu, offering good beers and wines. There would also be a restaurant with local service, local products and local food and in the basement we’d have a venue for live music. It would be a mix of a place like Hawksmoor and a pub like you’d find in the North of Scotland with a really warm atmosphere. I spend time with my girlfriend and we go to restaurants and bars. We travel a lot but mostly in winter, because my favourite season to be in Paris is summer. For me, Paris is about summer: drinking rosé along the river, then going to a cocktail bar when the sun goes down. Whisky because I grew up with it, just like the french do with wine. I like any kind of whisky even if for me Scotch is still the best. It’s more interesting in a cocktail for me, because for a long time I though you couldn’t mix a single malt in a cocktail… it’s a sin. Then I understood you can do whatever you want with whisky to enlist the flavours. They are dynamic in a large spectrum from poitin to old heavy peaty whisky. At the moment I really enjoy an Irish whisky called Method and Madness. The distiller comes with the method and refines the madness of his apprentice. They’re very funky with interesting flavours. Technique and balance. Stiring the right way, for the right amount of time, or shaking the right way, using frozen glasses, that all makes the difference. After that the delivery of the cocktail, the welcoming is as important as the cocktail. High standards and friendly service at the same time, just like offer here at Little Red Door. Here we like breaking the mould of the classic cocktails. In a manhattan the centre is the whisky, but we like to find another ingredient, like a fortified wine or a vermouth, anything that makes the main spirit secondary. For instance we use herbs for the contrast they can give to a drink, then the spirit is not the strongest flavour you experience. It’s about the contrast between them. I would say The Vault in Soho, under the oldest whisky shop in London. Also Happiness or Original Sin, because every time you walk in those places you feel at home. Otherwise I love Dandelyan, and the way they approach hospitality and drinks in a very casual manner, but it’s always spectacular. And last but not least, of course our Artesian family.